On this six night holiday you'll discover the beauty of Provence - a region where refinement and tradition blend beautifully, and whose natural light and landscapes have served as inspiration to the likes of Van Gogh, Cezanne, Picasso and Dumas, not to mention Peter Mayle! You'll look out over a patchwork blanket of fields, olive groves, vineyards and, in the south east, apple orchards which cover the floor between the mountains on either side. While the vineyards here may not be as well-known as those of the Rhone, Burgundy and Bordeaux, some superb wines are produced here - so be sure to stop off for a tasting or two. 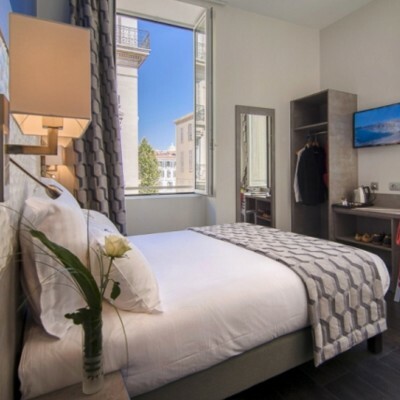 Your itinerary has been designed to give you a taste of the picturesque perched villages which pepper Provence's breathtaking, lavender-scented Luberon area. The hilly landscape of the region means the cycling can be challenging at times but for each tough climb you'll be rewarded with a spectacular view. Starting in the mediaeval town of Pernes-les-Fontaines, famous for its numerous ancient stone fountains and lavoirs, you'll enjoy far-reaching views over the Luberon as you make your way to the ochre-red village of Roussillon passing vineyards, chateaux and castles on the way. You then head out along the Ochre Trail and along country lanes to pass through some of the most beautiful villages in Provence - each one offering stirring images along with a history which, in some places, stretches back over a thousand years - before your final stretch takes in sweeping apple orchards, typical French villages, quaint cafes and the fascinating network of caves at Grotte de Thouzon. We've hand-picked a lovely selection of hotels for your holiday. The Hotel l'Hermitage in Pernes-les-Fontaines is set in 2 hectares of grounds with a saltwater swimming pool and its own orangery; whilst the Hotel les Sables d'Ocre in Roussillon sits amidst landscaped lawns with a relaxing pool area. Arrive at your 3 star hotel, just north of the town of Pernes-les-Fontaines. There's plenty of time to relax and explore the hotel grounds before dinner. 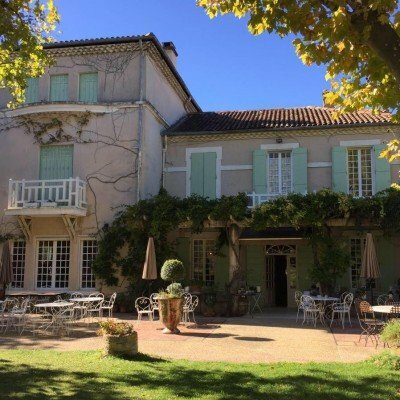 Pass by Pernes-les-Fontaines before setting off alongside the Canal de Carpentras and on through the beautiful scenery of the Vaucluse down to the popular town of L'Isle-sur-la-Sorgue. The old town here is entirely surrounded by the clear waters of the River Sorgue. 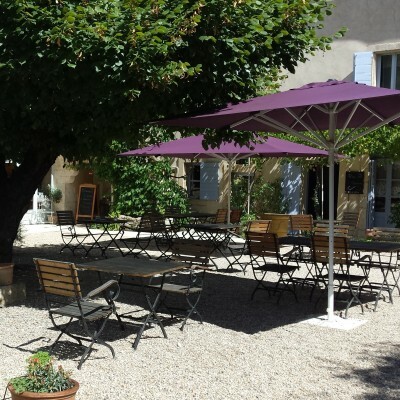 There are lots of lunch options in the town, or you could stop a little further on in the pretty village of Fontaine-de- Vaucluse. In the afternoon you climb to enjoy your first spectacular views of the Luberon before descending past vineyards, olive groves and windmills, and on to the ochre-painted village of Roussillon; this is the starting point of the Ochre Trail and your home for the next two nights. Explore Roussillon, one of the Plus Beaux Villages de France, to discover its ochre-red rocks, stone buildings and unusual rock formations known as the 'Provencal Colorado'. For those wanting a longer day out, it's a scenic cycle ride through Provencal countryside up to the picturesque perched village of St Saturnin-les-Apt with its crumbling castle and one of the best views in the Luberon. After breakfast, set out along the Ochre Trail to the village of Gargas where you have the opportunity to visit the Ochre Mines of Bruoux. Then head south along country lanes where a mixture of climbs and freewheeling takes you through some of the most beautiful villages in Provence. First there's Bonnieux, from where the nearby Chateau la Connorgue (made famous by Ridley Scott's A Good Year) can be visited for tastings. Then it's on to Lacoste to explore the ruined castle, once a mighty fortification and now a spectacular viewpoint. From here you'll freewheel down before another short climb to Menerbes, made famous by the books of Peter Mayle, and a great place to stop for lunch. The last leg takes you to Maubec where your hotel awaits. Take a circular ride past the orchards and meadows to the pretty villages of Lagnes, Robion and the beautiful watermill in Taillades. Or you could take a taxi to Saint-Remy-de-Provence, with its delightful old town, Roman site and monastery. This morning you ride through apple country where you'll see orchards aplenty. Following the lanes brings you to the mediaeval town of Le Thor, after which you pass the ruins of the fortified monastery at Thouzon, along with the Grotte de Thouzon; a network of caves carved out by an underground river. Then it's back to Pernes-les-Fontaines where you have time to explore the mediaeval old town and the numerous ancient stone fountains and lavoirs. 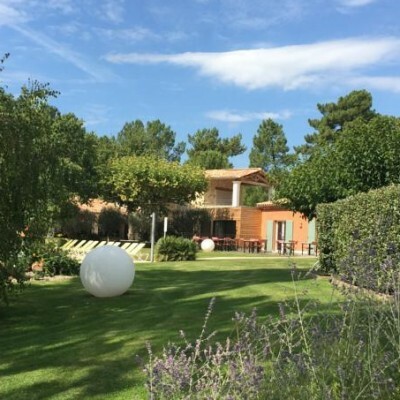 Just a 10 minute walk outside Roussillon, this modern hotel is surrounded by landscaped lawns and has a relaxing pool area. 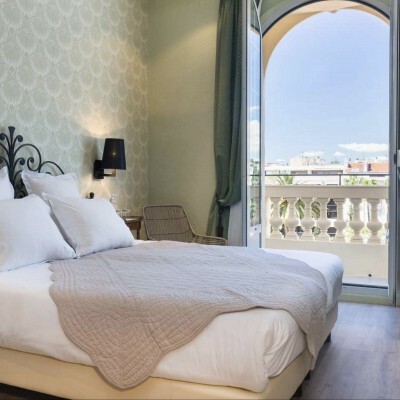 The good sized bedrooms are decorated in rich Provencal colours. 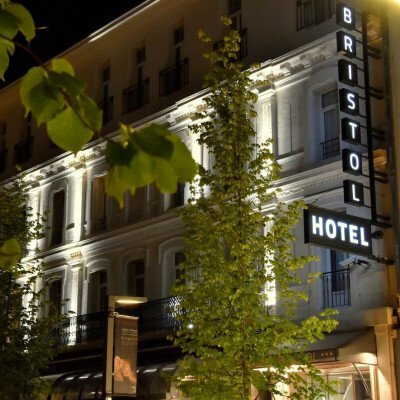 On day 1 customers should make their own way from Avignon TGV to Hotel Bristol approx 18€ before 7pm and 21€ after 7pm and Sundays, approx 4km. Transfer on day 2 is included from Hotel Bristol at 16:30, and back to Avignon TGV train station at 11:50. Marvellous area . Notes for cycling extremely poor . The hotel at Roussillon CLOSED at 8.00pm .and had no gin and no beer . It was like a travel road house ! A very enjoyable cycling holiday. The route was well researched using very quiet roads whenever possible, passing through lovely and varied countryside with stops in all the interesting hilltop villages. The hotels were all very comfortable and meals where provided were excellent. Our guide Mark was knowledgeable and couldn't have been more helpful. Really enjoyable way to experience local cultures and get ‘off the beaten track ‘ good local representative support . Very well organised, with excellent directions and achievable distances to cycle daily. Cycles very good condition, well maintained, clean and comfortable to ride. All staff willing and able to support if required. Incredible 200 km of beautiful countryside, cuisine and culture of Provence! Loved every minute despite 35° heat and 35% elevation. La vie est belle! This holiday has given us the opportunity to see some of the most beautiful villages in Provence under our own steam and away from the crowds you'd find on a typical coach trip The exercise of cycling during the day is a great appetite-sharpener for enjoying some excellent food and local wines in the evening. The two holidays we have had with Headwater were extremely enjoyable. Our first was a walking holiday and the second was a cycling holiday. Great cycling location with generally very quiet roads, beautiful countryside and pretty villages perched on hilltops - definitely a great way to explore the region - you can smell the lavender fields and really enjoy the countryside. Both Keith and Claire were excellent reps - really friendly, helpful and flexible in every way. The food at Dame L'Oie in Perne la Fontaine was superb as was the food at Hotel de Sable. Quality of the bikes was very good. The itinerary for the rest day at Maubec was a little underwhelming as we felt the villages weren't that picturesque with few options for coffee/stop-offs and only managed to get lunch at the last stop in Robion. We would have preferred to go back to Lacoste and Menerbes which we had whizzed through the day before. Every two days from 27th Apr 2019 to 22nd Oct 2019, for 6 nights. All dates are subject to availability, please contact us to check. It is possible to hire electric bikes for this holiday at a supplement of £136 per person. As these are available on a first come first served basis, we recommend early booking to avoid disappointment. Due to the tailor-made nature of our holidays, we need a little more information in order for us to check availability for Hilltop Villages of Provence Cycling. Simply complete the form below and a member of our sales team will contact you (when it's most convenient for you) to provide availability information, travel options and an accurate price. Of course there's no obligation, but if you do wish to proceed with a booking they will be on-hand to assist you throughout the process.